MIAMI: Roger Federer lifted the 101st title of his remarkable career on Sunday in dominating style, beating ATP Miami Open defending champion John Isner 6-1, 6-4. “I will have to take baby steps going back onto the clay, I have played so little in the last few years so I don´t know what to expect but what this win does is takes even more pressure off me,” Federer said. “Already just how I´ve been playing and moving here makes me believe just going on vacation now, a bit of a break, and then preparation, you physically I should be fine, but again, we´ll see how the body is going to react. “I am excited. It´s a good challenge,” added Federer of trying to dethrone Rafael Nadal at Roland Garros when the second Grand Slam of the season begins on May 26. “Madrid will be ´let´s see what happens´ and then obviously I want to be ready for Paris and I hope all that hard work is going to pay off for the grass and hard court season,” he said. 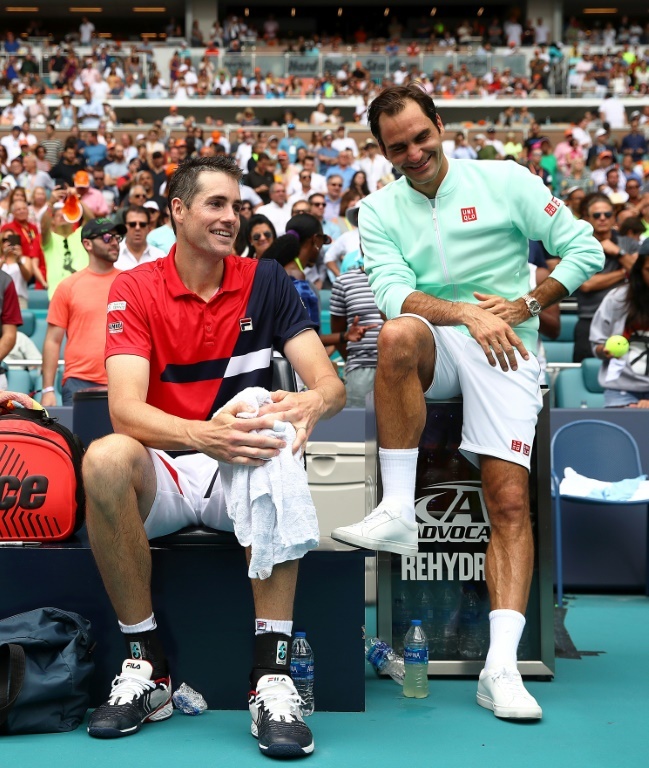 Against Isner, Federer seized control immediately as a break in the very first game sapped Isner´s confidence and allowed Federer to aggressively gain control of a match which he never looked like losing, especially after the American´s foot problem worsened. “Somewhere during the first set I started feeling pain on top of my foot and it didn´t go away and it just got worse,” Isner said. Isner´s spirit was crushed after he dropped the first set in only 23 minutes. “It´s a terrible feeling, because you´re on an island out there. You have no teammates to hide behind and going up against the greatest player ever, you know, playing in this incredible atmosphere, and my foot´s killing me. “I have never had a broken foot, but that´s what I would imagine it would feel like. This was Federer´s 154th tour final and his 50th ATP Masters showpiece appearance. He´s in the twilight of his stellar career but has no plans to hang up his racket just yet. “In terms of goals, it´s about trying to win titles and trying to manage life so I stay injury-free,” the former world number one said. “Some days you just don´t feel so well but this is a good phase, a good stretch for me right now. I really feel super healthy. That´s why I have been able to play every day for the last four weeks. That´s something that maybe hasn´t always been the case for the last few years. Isner´s booming serve failed to fire and there was to be no repeat of their last meeting at the Paris Masters 2015 when Federer was defeated in a third round encounter.